Database.com – Why? How? What? Developers are moving to the cloud because users expect their applications to be available from multiple devices – not just a PC or Mac – but a myriad new computers that come in the shapes of tablets, smart phones, and purpose-built devices. Users want be able to access their data from home, work, and on the road; CIOs want this data to be secure and manageable, the databases to be reliable and available; and developers want to be able to build more applications without having to worry about installing software, tuning the database, or worrying about scale. Developers today are faced with some false choices – they can choose a database that was built for the on-premise world and is hosted in a “blue” cloud replicating the architecture and the pains of on-premise; or, they can choose a database that’s built for the cloud but lacks basic features like the ability to have a schema e.g., key value cloud databases. Moreover, users don’t just want a data store – they want to be able to search this data, report on this data, and have a model for securely sharing this data with the right people. Our customers have had access to a reliable, scalable, and secure cloud database for over 10 years now. 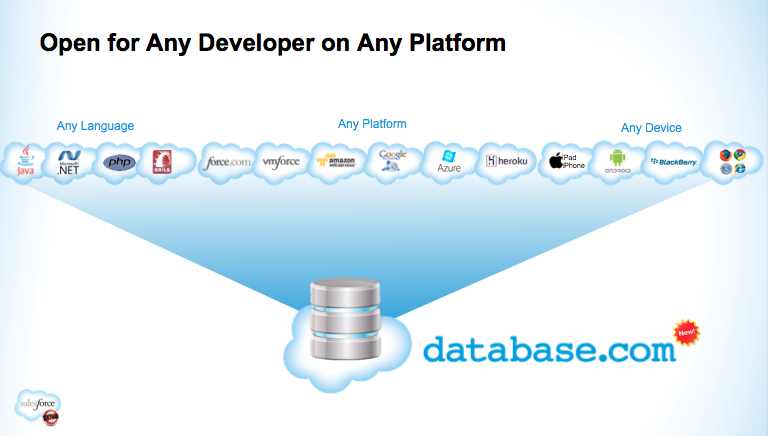 The database that underlies all of salesforce.com including Sales Cloud, Service Cloud and Force.com – is built for the cloud with a unique multitenant architecture that scales – our customers executed over 25 Billion in the last quarter, and now store over 20 Billion records in the database. Until today, this database was accessible via our applications and our platform – but we realized that this unique technology can serve the needs of many more developers and customers if it could be accessed by developers on any platform, using any language and with any device or computer. In launching Database.com, we are taking the next logical step in the evolution of our platform toward openness. Database.com is an open database, accessible from any language – Java, .NET, PHP, Ruby, etc. – any platform, including not only our cloud platforms, such as force.com and VMforce, but also Amazon, Google, Azure, Heroku, etc., and of course accessible directly from any device. Let’s evaluate the need for Cloud 2 Database from the perspective of three key stakeholders – users, developers and CIOs. CIOs no longer want to spend 85 percent of their budget just keeping the lights on. They want to unleash innovation and deliver business value. This year’s Gartner survey reveals the top ten items on CIOs’ budgets. Cloud computing is near the top of the list, which also includes Web2.0, mobile, and data & document management. How much time and money does it take to manage databases today in your current environment? How can you match the innovation of the Facebook Era and bring it to your enterprise? The Facebook generation is no longer just people just graduated from college but also baby boomers (see this New York Times report – requires registration). Are you able to deliver apps that are social and mobile? How much time and money is wasted in kluging together disparate technologies just to get basic features like search and reporting to work against your existing database systems? What if you could write your applications for any platform and any language but not have to worry about mundane tasks that provide neither business value nor agility? Can you start building your application right away or do you need to first install and fuse together ten different pieces? Are you spending more time writing interesting, new applications or more time simply keeping the old ones running? Are your OS upgrades, database upgrades, and hardware upgrades managed for you? Or do you have to spend time doing that? Are you spending time on database setup, provisioning, management and other tasks? Are you able to write the business logic of the application and then offer features like search and mobile? Or do you have to cobble it all together? Are you using an infrastructure cloud today? If so, does it offer all the services you need to build your apps and does it automatically manage those for you? Can you build apps that are mobile and social? How do you do that? Programming used to be fun. We think it can be fun again if you can focus on what you do best and let all the painful stuff like OS and database patch upgrades be managed by the cloud provider. Any Platform: As an enterprise database in the cloud, it should be accessible to developers on all platforms – cloud or on-premise – through standards-based API’s and protocols. Any Language: Being open to any language is critical to supporting the innovation of the developer community. Development and adoption of new languages is increasing at an amazing rate but data storage represented a universal need. Any Device: With the growth of mobile devices and an increasingly connected internet-of-things, the database must be open to use from any and all of these clients in a clean, consistent and secure manner. Building business logic for an application is becoming easier and easier as tools and Platform-as-a-Service vendors continue to evolve and deliver unparalleled developer productivity. However, setting up and managing the database that is secure & scalable continues to be a challenge. The developer must choose upfront whether they can afford the restrictions of a cloud data store or must take on the administrative burden of a traditional RDBMS. With database.com, the developer can avoid having to choose between functionality and complexity and take advantage of the bests of both worlds. Multitenant: Database.com was designed from the very beginning to manage a vast, ever-changing set of database structures on behalf of each and every application using a common infrastructure. This is not a re-hosting of 30-year old notion of a database system. Internet Scale: The service is proven to deliver scalability and is already the largest enterprise cloud database on the market. Automated Upgrades: Software, hardware, and system infrastructure is upgraded automatically to ensure that your applications can leverage advances in performance and security without effort. Automatic Tuning & Backup: It is a given that data and workloads change over time. With Database.com, the administration for ensuring continuing performance is provided as a part of the service. Backups or disaster recovery services are available automatically when needed without impacting development and deployment schedules. Application Developer Centric: Database.com is focused on the application developer – eliminating the need for low level administration tasks associated with the pain of administering previous generation database systems. As a service, it exposes that functionality needed to deliver killer applications and takes care of all the rest for you. Search: You have the ability to search any and all data in your enterprise apps. Web Services: Without having to install software or write any code, your data is available via web services in a secure, managed way via SOAP and REST APIs. Built-in Security: Security in an application is both critical and extremely difficult to get right – the rules and exploits are constantly changing. Database.com takes care of the underlying security so that you can focus on the data privacy needed within your application. Event-driven Push: Proactive notifications are quickly becoming a required feature in many applications – particularly mobile apps. Database.com provides a built-in infrastructure for event-driven push without requiring you as a developer to learn, develop and deploy a whole new set of infrastructure components. Social Data Model & Feeds: Finally, every database built on Database.com is inherently social – supporting an activity feed schema, API’s for posting comments and files and notifying users of new activities. Talk to your salesforce.com executive in a conversation on your database needs and your application development roadmap. Watch these videos to learn more about Database.com and the Force.com platform. You can get started today with a Free Force.com Developer Edition! Encourage your development team to start building applications using the Free Force.com Developer Edition. Read Developing with Database.com, a practical roadmap to help you get started with Database.com development. Sign up for a Free Force.com Developer Edition account and get started today. 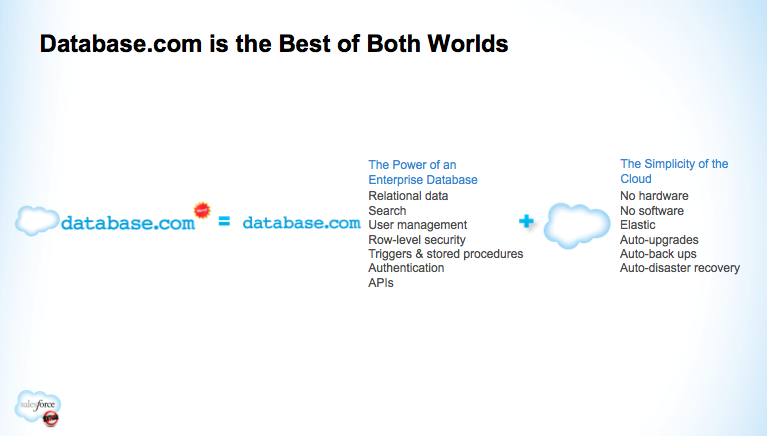 Because Database.com is the database at the heart of Force.com, you can tap into its power today using Force.com APIs and toolkits. Get ready to be a Cloud 2 Database developer!